Isn't it crazy to think we are almost halfway through 2016? And even crazier is that in July I will be celebrating my 4th year of blogging - my how the time has flown by! Anyway enough reminiscing, time for yet another massive Empties posts. This little tube of primer has been my go-to since I received it a couple months back and I have been loving it. It pumps out as a very thin pale pink primer which applies to the skin easily and sinks in almost immediately. It does work really well to keep my makeup in place for basically the whole day and helps to keep oil at bay. I have already got another one of these on the go. I had heard so many good things about this foundation and I totally get why it is so hyped up. This has been my foundation of choice for the past month or so and I have really been enjoying it, clearly, as it is all finished up! For NZD $20, this foundation has medium-full buildable coverage, blends out so nicely with a damp sponge and really looks pretty natural on the skin for such high coverage. For an illuminating foundation, it works well on my oily/combination skin (with a primer and setting spray it lasts all day) and it's so affordable! It's also in a plastic bottle so no worries of it breaking and it has a pump (two pumps is more than enough to cover the face). I have already got another bottle started! This concealer is my holy grail. I have been through countless tubes and I am constantly frustrated that they don't stock it in NZ but I've found a good supplier on Trade Me! The Fair shade I had actually used up a while ago, but it had sunk its way back into my concealer collection and not the Empties bag I keep in my bathroom. It's a good one for under the eyes, but I also like it for around the face and it's especially good for touching up. The Brightener shade is my go-to for under the eyes; it is pink based so it helps to counteract dark circles and covers so well. The formula is light but good coverage and it blends well too, with no creasing. As you can imagine I am well into my next one already! I have been using this on and off for a while and went to use it a couple of weeks ago and noticed that it was smelling pretty bad so it was time to part with it. This product helps to promote hair growth in the brow area and I think it does a really good job. I have sparse eyebrows naturally and I am always wanting to make them look a bit thicker and fuller and this has helped. I would apply it at night, and the doe foot applicator makes it easy to do a couple of strokes through the brow hairs. If you used it consistently for a couple of months I can definitely say you would notice a difference. Another trusty favourite is this very affordable Brow Pencil from one of my favourite brands, Colourpop. The colour works so well for me and I find I can get a really precise brow using this. The spoolie on the other end helps to blend it all nicely through the hair and this stays in place all day. I already have a few backups of this! I was really surprised that I managed to get through these so quickly and actually thought that the clicker was broken, as all of a sudden it just stopped working! Anyway, these are recent releases from Australis and I did really like them. The Banana shade as you might suspect is a yellow shade, and, Musk is a light pink. The formula wasn't as full coverage as say the Maybelline Age Rewind but I found mixing the two worked really well. 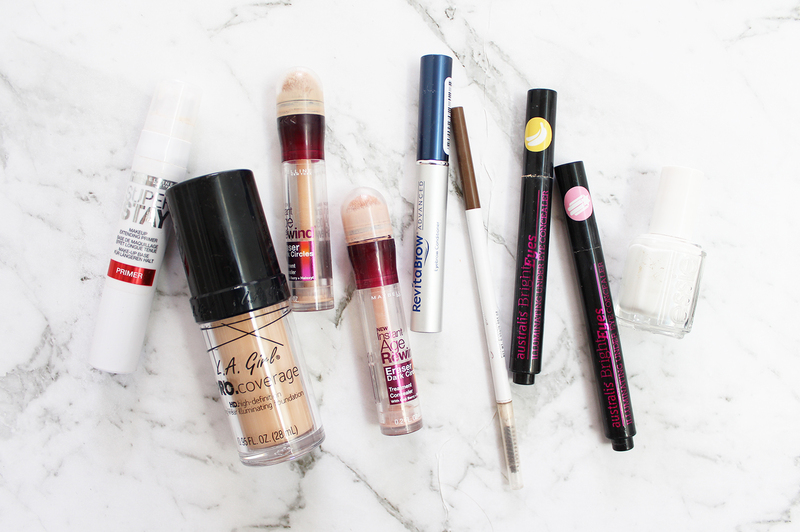 You could use them underneath a regular concealer to help colour correct or on top of concealer. The formula is dispensed through a click button on the end into a brush tip much like YSL Touche Eclat. I think I would buy these again! This is one of my favourite essie shade, it's just a pure creamy white and makes you look a little tanner and super fresh. I recently got a new bottle as this one was about half full and getting a little gluggy. As you will all know, I love and swear by this makeup remover. It works so well, doesn't sting or irritate and takes things off with ease. I have had this in my bathroom cupboard for a while and kept coming back to it if I ran out of my toner. This wasn't my favourite and I am not sure I would repurchase it. I don't generally like toners in a spritz bottle as I end up spraying on a cotton round and swiping it on my face that way as I can control it and it penetrates better into the skin. It worked fine, and it smelt nice, but I just didn't love it. 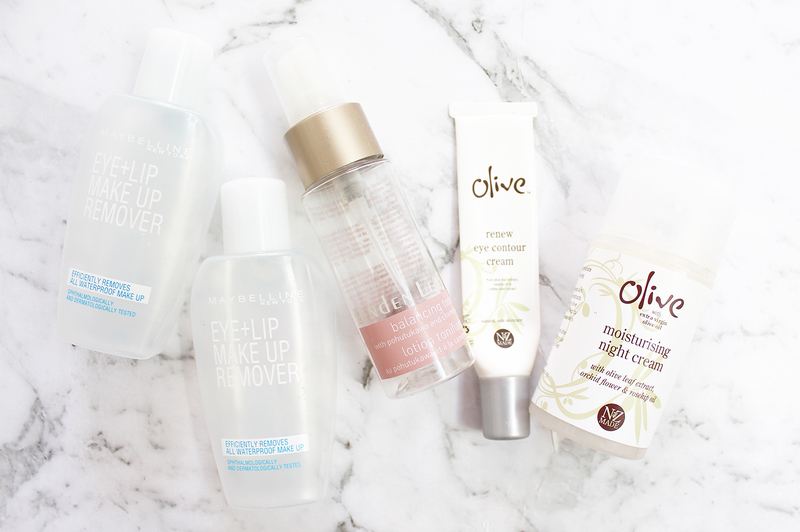 I was lucky enough to receive a lot of products from Olive to try out and this was another one I had been trying out. You can read more about Olive here, but they are an NZ owned and operated brand utilising the power of olive oil. I love a good eye cream, and I also love trying new ones out as there hasn't been one that has made me want to keep repurchasing it. This was a really nice one when it comes to eye cream. The cream was light but and it sunk in quickly and definitely added some much-needed moisture to the area. It worked well during the day under makeup, and well at night too. I really enjoyed using this night cream, it was on the thicker side and a small pump was all that was needed. It kept my skin balanced and in the morning it always felt soft and not too oily, or dry. I don't get too precious about what shampoo and conditioner I use and my hair is pretty resilient (even after a lot of dying and heat! ), but it does get oily pretty quick but my ends are dry. 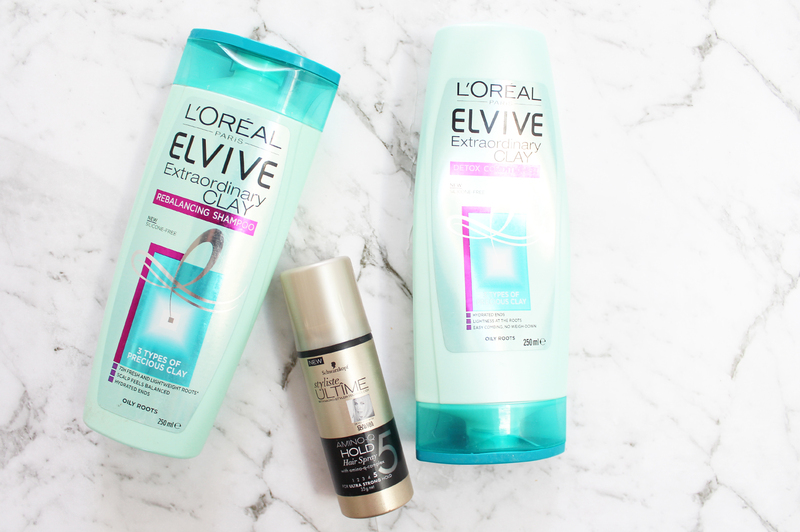 This new range from L'Oreal is designed for hair exactly like that and it worked so well! I am definitely going to be repurchasing this combination again, and the bonus is that you can find it easily as supermarkets. I use this little mini can when I am travelling and it always came in handy! It was a nice hair spray, didn't make the hair feel too crispy, and it did well to hold styles in place. I will definitely be getting another smaller can of this to have on hand when needed. 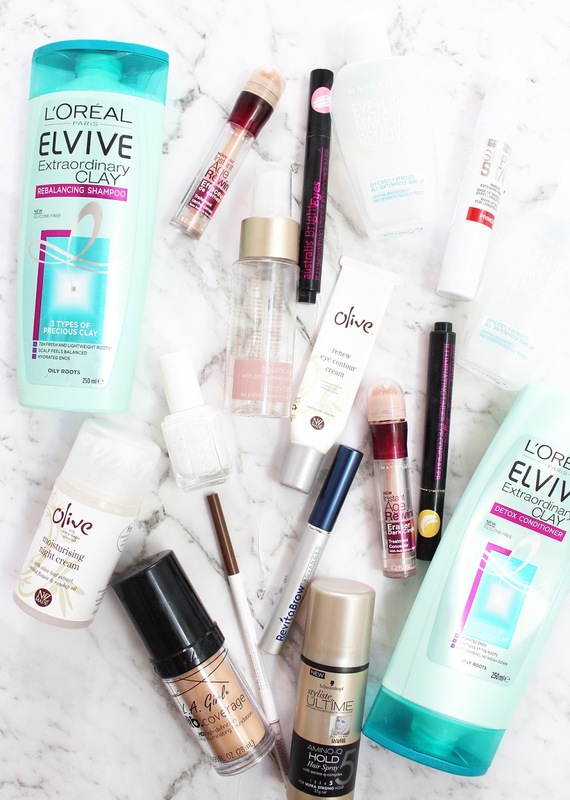 What products did you finish this month? Have you used any of these?